Frisée aux Lardons — Good Food Makes Me Happy! This beautiful salad pairs perfectly with the Thai Red Curry Mussels recipe. Use frisée if you can find it. It wasn't available yesterday when I was searching, so I used escarole which was delicious. You could also substitute arugula, radicchio, or a combination of any slightly bitter green. Top with a poached egg — slightly runny yolk so it mixes with the dressed salad greens, croutons and chopped bacon. Yummmmmm! In a bowl large enough to hold the salad, use a whisk to combine all of the mustard-garlic dressing ingredients. Set aside. Sauté the bacon until crisp, transfer to paper towels to drain. Pour off all but 2 tablespoons of the bacon drippings in the pan and add the baguette croutons and cook over medium-high heat, stirring and turning over so they brown on all sides. Set aside. Poach the eggs. I cheat and use an egg poacher, but if you're comfortable doing it in a nonstick skillet with 1-1/2 inches of water and 1 T. red wine vinegar, go for it! To assemble, add the washed and dried greens to the bowl with the dressing in it; toss well. 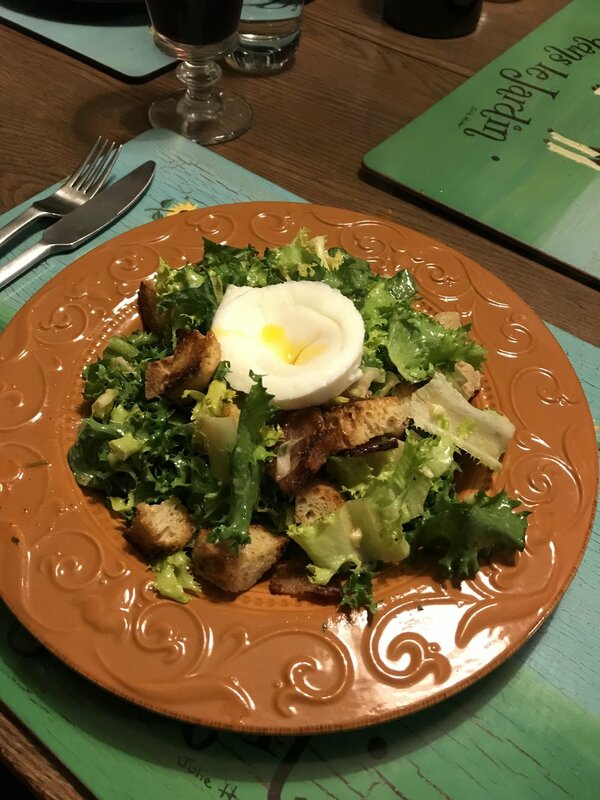 Divide the salad among four dinner plates, top with the poached egg and sprinkle the bacon bits and croutons over the top. Serve immediately. — Jacques Pépin, "More Fast Food My Way"